Thrust bearing hinges are a fantastic choice for those looking for a low-friction hinge suitable for operation by hundreds of people per day. Designed to be resistant to wear and tear and provide a smooth function, these hinges are often utilised in commercial settings, schools and industrial areas. That’s not all we have to offer though; Ironmongery Experts has a wide variety of hinges for every scenario imaginable, all available in an assortment of designs, sizes and metal finishes. 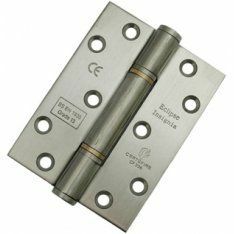 For example, our ball race hinges offer a versatile option ideal for a huge range of applications, and they’re also available with phosphor bronze washers as washered hinges. If your needs are more heavy-duty, consider our selection of heavy reversible hinges for cast-iron gates and outdoor fittings, tee hinges for equal weight distribution and reduced hinge strain, the more rust-resistant hook & band hinges or even the tensile strength offered by our broad butts and other frame accessories. However, if you’re looking for more compact, domestic components, see our premier array of cabinet hinges for kitchen cupboards and cabinets, or our small yet strong light duty hinges for lighter doors in and around the home. We also have piano hinges for efficient piano cover operation, and a more theft-resistant hinge in the form of spring hinges – perfect for the front and back doors. Finally, we also stock for doors that bypass an object upon opening; our range of parliament hinges contains various contemporary options, so feel free to browse at your leisure.